Welcome to the Scott Roberts Voice-Over website! You can contact Scott if your voice-over needs involve commercials, promos, podcasts, IVR, voicemail, phone systems, on-hold messages, training, business presentations, sales, websites, audiobooks, video games, documentaries, TV shows and movies, movie and game trailers, on-camera work, animated characters and more! If you require a personable, real, down-to-earth voice-over artist, voice-over talent, voice talent, voice actor, narrator, or announcer who is local to the St. Louis, MO metro area, then look no further. Scott Roberts has a deep, rich, friendly, “guy next door” voice that can fit just about any voice over need. From full-bore commercials, lead intros and promotions, to voicemail, podcasts and audiobooks. Scott’s your man. Scott can provide his voice “as is” or slip into a number of accents, moods, styles or characterizations that will be based on your voice-over needs. From cool and confident to wacky and inspired…from gruff and tough to warm and inviting. In addition to being a voice-over talent, Scott Roberts is a spicy food/hot sauce/BBQ expert, blogger and reviewer, whose main site can be found at ScottRobertsWeb.com. He is a columnist for Chile Pepper Magazine. 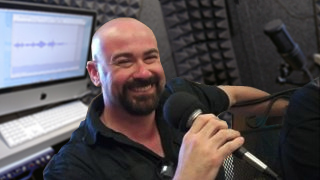 He also performs podcast hosting and production duties for The Firecast Podcast. Scott lives in the St. Louis, MO metro area. He is a follower of Jesus Christ, and is a proud husband and father. Serving the O'Fallon, Dardenne Prairie, Lake St. Louis, and greater St. Louis area. © 2011 - 2018 Scott Roberts Voice-Over. All Rights Reserved. Serving the St. Louis, Missouri metro area, the St. Charles County, MO area, and around the world.